"What a fascinating discovery this is!" said Paul Chodas, manager of the Center for Near-Earth Object Studies at NASA's Jet Propulsion Laboratory. "It's a strange visitor from a faraway star system, shaped like nothing we've ever seen in our own solar system neighborhood." 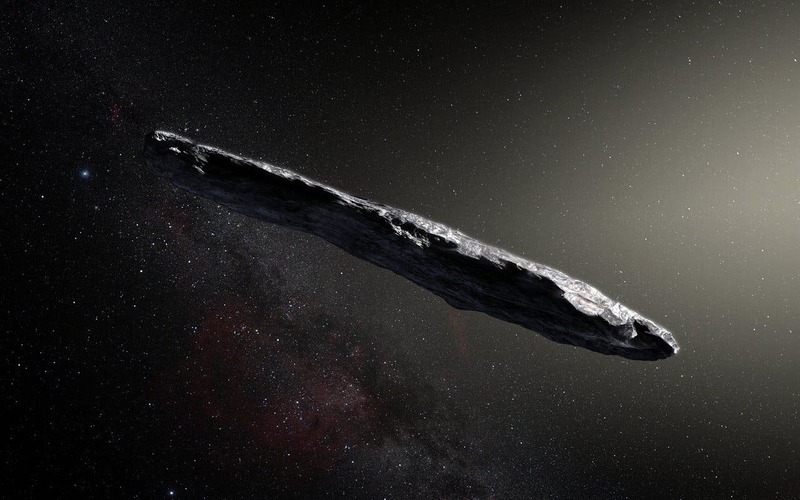 Now, new data reveal the interstellar interloper to be a rocky, cigar-shaped object with a somewhat reddish hue. The asteroid, named 'Oumuamua by its discoverers, is up to one-quarter mile (400 meters) long and highly-elongated-perhaps 10 times as long as it is wide. That aspect ratio is greater than that of any asteroid or comet observed in our solar system to date. While its elongated shape is quite surprising, and unlike asteroids seen in our solar system, it may provide new clues into how other solar systems formed. "For decades we've theorized that such interstellar objects are out there, and now – for the first time – we have direct evidence they exist," said Thomas Zurbuchen, associate administrator for NASA's Science Mission Directorate in Washington. "This history-making discovery is opening a new window to study formation of solar systems beyond our own." Immediately after its discovery, telescopes around the world, including ESO'sVery Large Telescopein Chile, were called into action to measure the object's orbit, brightness and color. Urgency for viewing from ground-based telescopes was vital to get the best data. Combining the images from theFORS instrumenton the ESO telescope using four different filters with those of other large telescopes, a team of astronomers led by Karen Meech of the Institute for Astronomy in Hawaii found that 'Oumuamua varies in brightness by a factor of 10 as it spins on its axis every 7.3 hours. No known asteroid or comet from our solar system varies so widely in brightness, with such a large ratio between length and width. The most elongated objects we have seen to date are no more than three times longer than they are wide. "This unusually big variation in brightness means that the object is highly elongated: about ten times as long as it is wide, with a complex, convoluted shape," said Meech. "We also found that it had a reddish color, similar to objects in the outer solar system, and confirmed that it is completely inert, without the faintest hint of dust around it." These properties suggest that 'Oumuamua is dense, composed of rock and possibly metals, has no water or ice, and that its surface was reddened due to the effects of irradiation from cosmic rays over hundreds of millions of years. A few large ground-based telescopes continue to track the asteroid, though it's rapidly fading as it recedes from our planet. Two of NASA's space telescopes (HubbleandSpitzer) are tracking the object the week of Nov. 20. As of Nov. 20, 'Oumuamua is travelling about 85,700 miles per hour (38.3 kilometers per second) relative to the Sun. Its location is approximately 124 million miles (200 million kilometers) from Earth — the distance between Mars and Jupiter – though its outbound path is about 20 degrees above the plane of planets that orbit the Sun. The object passed Mars's orbit around Nov. 1 and will pass Jupiter's orbit in May of 2018. It will travel beyond Saturn's orbit in January 2019; as it leaves our solar system, 'Oumuamua will head for the constellation Pegasus. Observations from large ground-based telescopes will continue until the object becomes too faint to be detected, sometime after mid-December. NASA's Center for Near-Earth Object Studies (CNEOS) continues to take all available tracking measurements to refine the trajectory of 1I/2017 U1 as it exits our solar system. This remarkable object was discovered Oct. 19by the University of Hawaii's Pan-STARRS1 telescope, funded by NASA'sNear-Earth Object Observations(NEOO) Program, which finds and tracks asteroids and comets in Earth's neighborhood. NASA Planetary Defense Officer Lindley Johnson said, "We are fortunate that our sky survey telescope was looking in the right place at the right time to capture this historic moment. This serendipitous discovery is bonus science enabled by NASA's efforts to find, track and characterize near-Earth objects that could potentially pose a threat to our planet." The object has since beenreclassified as interstellar asteroid1I/2017 U1 by the International Astronomical Union (IAU), which is responsible for granting official names to bodies in the solar system and beyond. In addition to the technical name, the Pan-STARRS team dubbed it 'Oumuamua (pronounced oh MOO-uh MOO-uh), which is Hawaiian for "a messenger from afar arriving first." Astronomers estimate that an interstellar asteroid similar to 'Oumuamua passes through the inner solar system about once per year, but they are faint and hard to spot and have been missed until now. It is only recently that survey telescopes, such as Pan-STARRS, are powerful enough to have a chance to discover them. "What a fascinating discovery this is!" said Paul Chodas, manager of the Center for Near-Earth Object Studies at NASA's Jet Propulsion Laboratory, Pasadena, California. "It's a strange visitor from a faraway star system, shaped like nothing we've ever seen in our own solar system neighborhood."